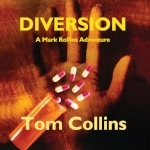 Come on guys; I need more reviews of my new book Diversion on Amazon or Goodreads. The gripping plot in Diversion unfolds against the backdrop of the opioid drug crisis in rural Middle Tennessee—an anesthesiologist dies, a young girl goes missing, and terrorists plot an attack that could kill thousands or shut down American’s military drones. Pill mills selling prescriptions for cash are showing up in the bucolic area around Manchester and Tullahoma, Tennessee, just outside of Nashville. The area is home to the Bonnaroo Music Festival and the propulsion test facilities at the Arnold Air Force Base that are essential to keep military drones flying in the war against terrorism. Both the Bonnaroo fans and the testing facilities are targets the country’s enemies are willing to die for. A call for help from an old family friend puts Mark Rollins and his high-tech team of crime fighters squarely in the middle of it all. It was a simple enough request. All Rollins had to do was drive to the jail in Manchester, collect the girl, and take her home to her frantic mother. But, the girl wasn’t there! What had seemed simple quickly became dangerously complicated. Diversion—the opioid drug crisis, a missing girl, Bonnaroo, and a plot to shut down American military drones. What the video trailer for more about Diversion. Etiquette not only sells, it is an essential building block in the pursue of business excellence. Only through people who truly care about customers can you achieve excellence in the eyes of those who judge you. Lydia Ramsey is a business etiquette speaker and trainer and the founder of Lydia Ramsey, Inc. a firm offering keynotes, seminars, and workshops to corporations, professional associations, government agencies, and colleges and universities. She is also the author of Manners That Sell. As Lydia explains it, “My business etiquette presentations are designed for organizations that want their people to be at ease in any business situation and to represent them well in the marketplace.” She explains that etiquette is not just about introductions and table manners. Manners sell. People want to do business with people they like, and people like nice people. Etiquette is about being nice and, we might even say, kind. There is that word again, “kind or kindness.” Look up kind or kindness and you will discover that four words are always closely linked—kindness, courtesy, polite, and etiquette. Each is an aspect of the other and they all represent behavior that shows respect for other people. You cannot achieve them without a genuine concern or “care” about others. The best salesperson delivers value; the best conversationalist is a good listener; the best king desires to put subjects at ease. It is a standard of behavior. You cannot compartmentalize it or limit it to just one category of people. That is why we say that Common Courtesy is a job requirement. Customer care first requires caring about people in general. It is the leader’s job to insist that nothing short of common courtesy is acceptable. Kindness, politeness, and etiquette (putting others at ease) are job requirements of the excellence company. Change is constant, and I am engage in making a number of them. First, having the site under my name as an author makes sense. People are more likely to search the web by my name than by the either the publisher name, I 65 North, Inc. or by the name of my mystery services, Mark Rollins adventure mysteries. In the near future people searching for markrollinsadventures.com or i65north.com will be rerouted to TomCollinsAuthor.com. At the same time I make this change, I am consolidating my blogs. I will no longer maintain both I65northblog.com. whataboutebooks.com. I65northblog is being renamed TomCollinsAuthorblog.com and I will discontinue maintaining whataboutebooks.com. If you have any doubt that change is constant, check out T-shirt the gang at Juris had made of “me” to celebrate one of my birthdays when I still had hair. I forget which. As for the Newsletter, right now it is taking a rest while I concentrate on finishing my current novel DIVERSION.